Log in to canelink.miami.edu. Click on "Orientation Registration" to register for 'Cane Kickoff. Log in to canelink.miami.edu. Click on the "Housing Application Process" link on your student home page to be directed to the Housing and Residential Life page. Navigate to CaneLink > Go to Student Center > Personal Information (section). You can either select Addresses in the drop down (shown below) or click on the hyperlinks in the Contact Information section of the page. NOTE: Your on campus address is fixed by the office of student housing. If you need to make a revision to your on campus, contact the office of student housing. Navigate to CaneLink > Go to Student Center > Personal Information (section). 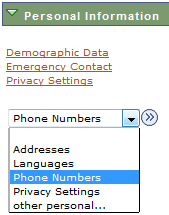 You can either select Phone Numbers in the drop down (shown below) or click on the hyperlinks in the Contact Information section of the page. Navigate to CaneLink > Go to Student Center > Personal Information (section). 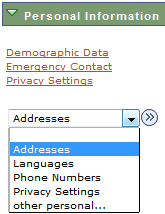 Select the Emergency Contact hyperlink. How do I suppress my directory information? To learn more about your privacy, please click here. Can I set up my direct deposit account to multiple accounts? Student account refunds may only be sent to one account and may not be split among multiple bank accounts. However, you may change the direct deposit routing to any eligible bank account at any time using CaneLink. The communications center module allows the University to post messages for you to see. These messages could be announcements about upcoming action items for registration, financial aid, or a variety of topics related to your online access to the student information system at the University. As of June 1, 2017, all communications are sent to the new Message Center module located in the Student Center. Communications posted to the Communication Center prior to June 1, 2017 will remain there to be viewed. NOTE: Communications are delivered as pop-up windows. If you cannot access your communications, ensure that your browser’s pop-up blocker function has been disabled. The Message Center module allows the University to post secure messages for you to see. These messages could be announcements about upcoming action items for registration, financial aid, or a variety of topics related to your online access to the student information system at the University. You will receive an email when you have new messages to view in the message center. NOTE: Some communications are delivered as pop-up windows. If you cannot access your communications, ensure that your browser’s pop-up blocker function has been disabled. What is an Academic Advising Hold? An Academic Advising Hold will be placed on your record if you are required to see an Advisor before registering for classes. Once you have met with your Advisor, the hold will be removed and you will be able to enroll when your Enrollment Date is available. How do I know I have a hold? Navigate to CaneLink > Go to Student Center > Holds (section). Click details to see additional information about the hold. What is the To Do List? The “To Do List” contains action items defined by various offices that you are required to complete. How do I delegate proxy access to someone whom I want to be able to see my student information? The process of creating and maintaining a proxy account is controlled by you. You must grant approval for all proxies and you can select which services proxies may access on your behalf. What other options are available for me to search for classes? Besides using the Class Search, you have two additional options for searching for classes when you are ready to enroll for a term. Navigate to CaneLink > Go to Student Center > Academics (section) > Enroll. You can then search for classes by Class Search, My Requirements, or My Planner. Search by My Requirements uses your academic requirements (if available for your Academic Program) to execute the Class Search. Search by My Planner uses your Academic Planner (if you have utilized this tool) to execute the Class Search. What other sections are still available and can be found by navigation to CaneLink? I’m a student employee, can I still see my paycheck in Workday? Yes, you will still use Workday (workday.miami.edu) to view your employee related data. How do I access Blackboard from CaneLink? Go to canelink.miami.edu, and you will see the Blackboard link on the first page. Where can I find information about my grade point average (GPA)? and then select the ‘term information’ tab at the top right of the next page. You would then select the ‘View my grades’ option to see your cumulative grade point average at the bottom of that page. You also have the option to use the dropdown box located directly under the ‘My Academics’ option and select the ‘Grades’ option to view your grades or you can select the ‘Transcript: View Unofficial’ option to navigate to your unofficial transcript. Any of these options will allow you to access grade point average information. An online tutorial on this topic is available here. What is a Degree Progress Report and where can I find mine? The Degree Progress Report is a tool that lists all of the classes you are required to complete in order to graduate. All of the courses you’ve completed are listed in this document. Access to this document is available from your Student Center. 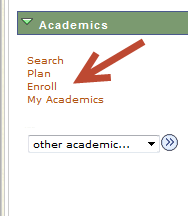 Select the ‘My Academics’ option located under ‘Academics’ on the upper left-hand side of your Student Center. Then select the ‘View my advisement report’ tab under ‘Academic Requirements’. 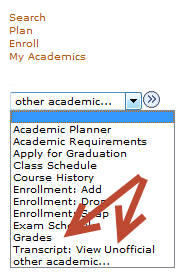 You also have the option to use the dropdown box located directly under the ‘My Academics’ option. Navigate to your Degree Progress Report by selecting the ‘Academic Requirements’ option. An online tutorial on this topic is available for you to view at: online Degree Report tutorial. I know my University identification number (C-Number) but I am told that I also have another identification number. Some of my professors have referred to a number that starts with a “5.” What is this number and is it my real identification number? Your University identification number (your C#) has not changed; however, you also have a second identifying number in CaneLink that may be used by your faculty. This number, sometimes referred to as your emplID, can be found in the ‘Personal Information’ section at the bottom of your Student Center under the ‘Demographic Information’ link. 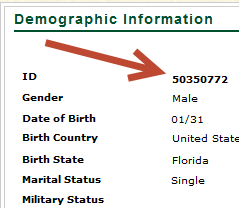 As you navigate to your Demographic Information, your emplID number will be visible at the top of that page. Your Academic Advisor is listed on the Student Center main page. If no advisor is listed, notify the dean’s office in your school or college. What is the Academic Planner? The Academic Planner is a tool for you to use to plan out the courses you may want to take each term. You can select courses from the course catalog and organize the courses by terms. The Academic Planner can be used for term-based or multi-year planning purposes and courses can be placed in your Planner independent of actual course offerings. Once courses are organized in your Academic Planner, you can search for classes scheduled for the term for which you would like to register once the Schedule of Classes has been made available for that term. Enrollment Dates are the dates you will be allowed to access the system to enroll in classes for a given term. You could have multiple Enrollment Dates. 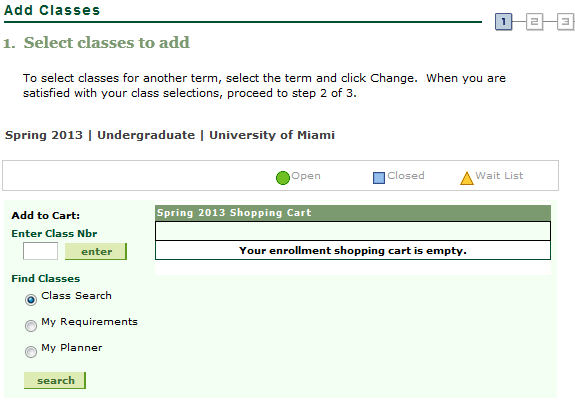 The Shopping Cart is a tool that allows you to store courses in which you intend to enroll in a specific term. You can place classes in your Shopping Cart once the Schedule of Classes has been published, and the Shopping Cart is made available for the term. Click the “validate” button to ensure that you meet the pre-requisites for the classes you have selected and there are no scheduling. You must place classes in your Shopping Cart in order to enroll. Once the classes are in your Shopping Cart and your Enrollment Date(s) has/have arrived, you can enroll directly from your Shopping Cart. Each section of a class is assigned a limit on the number of students allowed to enroll. This is called the enrollment capacity. Once the registration process begins, students can begin enrolling in the section. Once the enrollment capacity is reached, the waitlist functionality automatically becomes available. Students may then elect to add themselves to the waitlist. A process runs nightly to enroll students into open seats based on their position on the waitlist and eligibility. The waitlist is first come, first served. A class remains closed until the waitlist empties. Students on the waitlist that are not enrolled maintain their position number and will be enrolled if they qualify the next time a seat is made available. If the waitlist process runs and no eligible students are on the waitlist, the class will open and other students can enroll (even if there are still students on the waitlist that do not meet the criteria to be enrolled). IMPORTANT: If you do not meet the pre-requisites for a course, or there is a scheduling conflict, you will be skipped over on the waitlist. It is imperative that you validate courses from your shopping cart prior to adding them to your waitlist. Schools will be monitoring waitlists and opening additional seats in the section/class as needed. How often does the waitlist process run? In what order does the waitlist process run? The process runs on classes in sequential order based on course ID, course offering number, term, session code, and class section. For example: “1” runs before “2”, and “a” runs before “b”. A multiple component class that has two lectures (sections 1 and 2) and two labs (sections 1A and 1B), would run in the following order: section 1, 1A, 1B, 2. What is the first and last day to get on a waitlist for a class? You cannot get on a waitlist until your enrollment appointment occurs. The last day to get on a waitlist will be the last day to add classes as found on the Academic Calendar. Will I be notified if I have been enrolled in a waitlisted class? You will not be notified if you are enrolled in one of your waitlist classes. It is recommended that you monitor your class schedule each morning by logging into CaneLink and reviewing your Class Schedule. The waitlist option is available once all seats in a class have been filled and the section closes. If you include closed classes in a Class Search, you will see a yellow triangle beside classes that have available waitlist seats. When the waitlist capacity is reached, you will see a blue square, which indicates the class is closed. You cannot choose your preference for which section you will be enrolled in first. The waitlist process will enroll you in the section that has the first available seat. Once enrolled in one of those class sections, you will be listed as Waiting in your Class Schedule for all other sections, and you will not be enrolled in any of them. If you have been enrolled in a section from the waitlist, but you would like to be enrolled in a different section, you must drop the Waiting section and do a Swap with the section for which you are enrolled. Please see information about Swap below. The Swap feature allows you to identify a class that you are currently enrolled in and trade it for a closed class that you would prefer. You cannot set up a Swap for a class in which you are already on the waitlist. You must drop out of the waitlist, and then set up a swap. When should the Swap enrollment feature be used? If you are enrolled in a class that is your second choice, you can Swap that class for a waitlist class. Use this feature if you are enrolled in a class, but would prefer a different class that is taught on the same day and time, or if you are already enrolled in the maximum number of credits for a term and want to still get on a waitlist. NOTE: Swap does not guarantee that you will be enrolled in your waitlist class(es). Can I see when I have a Swap? No, you cannot see classes that you have set up as a Swap. Can I remove myself from a waitlist? Yes, you can remove yourself from a waitlist by dropping from the waitlisted section in self-service during the add/drop period. If you are no longer interested in remaining on the waitlist please remove yourself from the waitlist. What will prevent me from getting on a waitlist? What will prevent me from being enrolled in a class while I’m on the waitlist? IMPORTANT: If you are not enrolled from the waitlist due to any of these issues, you will be passed over and the next eligible student on the waitlist will be enrolled. What is the maximum number of credits for which I can waitlist? You can waitlist for up to 21 credits at a time. You cannot exceed your enrollment limit when you are enrolled from a waitlisted class. How do I know what number I am on a waitlist? You can see your waitlist number in the Student Center > Enroll > My Class Schedule. Your waitlist position number is displayed once you place yourself on the waitlist. Can I get on a waitlist for a class that has a reserve capacity? Reserve Capacity is used when seats are reserved in a class for particular groups or classes of students. Typically you will see seats reserved for students in the major, or seniors, or seniors in the major. If a class has a reserve capacity and the only open seats are restricted, and if you do not meet the restrictions, you can get on a waitlist for the class. You will only be enrolled in the class if an unrestricted seat becomes available. Can I get on a waitlist if there is a time conflict with a class section in which I am already enrolled? The enrollment process does not check for a time conflict when you waitlist a class. When the enrollment process runs, you will not be enrolled in the class if a time conflict exists. You must drop the conflicting class if you want to be enrolled from the waitlist. Always validate classes in your shopping cart prior to adding them to your waitlist. NOTE: Use the Swap feature when waitlisting for a class that conflicts with a class that you are enrolled in. That way, if a seat opens in the closed class, you will be automatically dropped from the previously enrolled class. Do I have to pay tuition for waitlisted classes? No. Tuition is only calculated based on classes for which you are enrolled. 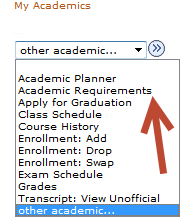 What is the “My Academic Requirements” feature used for? Your academic requirements (or Degree Progress Report, DPR for short) are the requirements established to meet your degree objectives. View your Degree Progress Report by navigating to CaneLink > Go to Student Center > Academics (section) > My Academics > View My Advisement Report. NOTE: The Degree Progress Report is one tool used for evaluating whether you have met the requirements for your degree. It is NOT a transcript and it is NOT an official document. There is no guarantee that the Degree Progress Report includes all exceptions, course substitutions, waivers or transfer credit. It is the responsibility of students to meet with their advisors to verify that they meet degree requirements per their Academic Bulletin.